DD Form 503 or the "Health Assessment Certificate For Segregation" is a Department of Defense-issued form used by and within the United States Army. The form - often mistakenly referred to as the DA form 503 - was last revised on March 1, 2013. Download an up-to-date fillable PDF version of the DD 503 down below or find it on the Department of Defense documentation website. medical attention, and find no medical reason(s) that prohibit(s) segregated housing as required at this time. 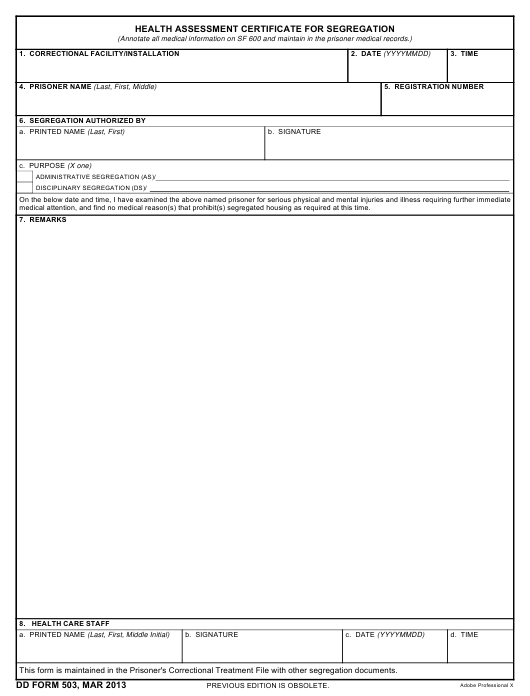 This form is maintained in the Prisoner's Correctional Treatment File with other segregation documents.